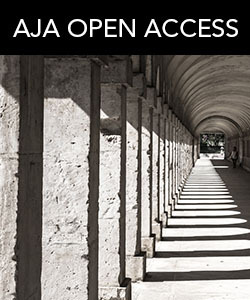 The AJA Learning Resources page is an accessible starting point for those interested in a career in archaeology as well as a place to browse archaeological projects, databases, and image and bibliographic resources. These helpful, trusted links are regularly checked and updated by AJA staff. The British Museum Collection Online: Advanced search tool for nearly two million objects in the museum’s collections. Hispania Epigraphica Online Database: In Spanish and English. A collection of Roman inscriptions from the Iberian peninsula, featuring a few different ways to search. Last Statues of Antiquity Database: University of Oxford. Oriental Institute’s Collection Search: Oriental Institute of the University of Chicago. AWOL - The Ancient World Online: This blog offers descriptions and discussion of digital resources for the study of the ancient world. Inscriptiones Christianae Graecae: A database of early Christian inscriptions from Asia Minor and Greece. Nestor: A searchable bibliography for Aegean studies, Homeric society, Indo-European linguistics, and related material. It also includes a directory of Aegean prehistorians. Persepolis Fortification Archive Project: From the Oriental Institute of the University of Chicago, blog for the Persepolis Fortification Archive Project. Perseus Digital Library: An enormous digital collection that includes texts and an art and archaeology artifact browser. Projekt Dyabola: Maintained by Biering & Brinkmann, the Dyabola project is a collection of databases of bibliographic data and image collections in the arts and humanities. Heritage, Conservation & Archaeology (from the AIA): Heritage, Conservation & Archaeology is a series of articles designed to give experts across the many disciplines related to site preservation an opportunity to share their experiences and generate discussion among professionals. Ancient World Mapping Center: This center is dedicated to stressing the importance of cartography, historical geography, and geographic information science in ancient studies. The site includes free maps for student use, as well as other resources. The Classical Art Research Centre: In addition to the Beazley pottery database, there are other pottery databases and resources. Digital Collections from the American School of Classical Studies at Athens: Includes books, journals, photographs, notebooks, personal papers, maps, and scientific data sets. ICOMOS Mediatheque: A collaborative photobank that includes partially copyright free images that comply with ICOMOS’ scientific, pedagogical, and non-profit principals. The Metropolitan Museum of Art Open Access for Scholarly Content: This initiative from the MET provides license- and cost-free access to images of some artwork in their collections. The Digital Atlas of Roman and Medieval Civilizations. Maps and geodatabases that bear on multiple aspects of Roman and medieval civilization. Digital Forma Urbis Romae Project: Stanford University. Digital Karnak: From the University of California at Los Angeles. This project includes a high-quality, easy-to-use time map as well as a comprehensive introduction to the site, a catalog of monuments and features, and the ability to view a reconstruction of the site through time via Google Earth. Digital Pompeii Project: A joint project of the Classical Studies Program, the Humanities Program, and the Center for Advanced Spatial Technology at the University of Arkansas. It aims to create a comprehensive database for visual art and material culture at Pompeii, which will be linked with a 3D model of the city that can be explored in real time. Digital Roman Forum: From the University of California, Los Angeles. A digital model of the Forum as it may have appeared in antiquity. The Giza Archives: From the Museum of Fine Arts, Boston. A collection of photographs and other data from the museum’s work at the site. Google Arts & Culture: Explore heritage sites in Street-View panorama with Google’s World Wonders Project. There are also 3D views, videos, and classroom material for educators. Featured archaeological sites include Pompeii and Stonehenge. Metis: Archive of panoramic views of Greek archaeological sites. Ostia - Harbour City of Ancient Rome: This website has been around since 1996, and with its reconstruction videos, a topographical dictionary, footage of old excavations, and extensive text, it is a unique introduction to the complete context of an archaeological site. Abydos Excavations: Institute of Fine Arts at New York University, University of Pennsylvania, and Peabody Museum of Yale University. Excavations at Amheida in Egypt’s Dakhleh Oasis: New York University and Columbia University. This project began in 2001 and provides undergraduate students with a study abroad/fieldwork opportunity. The website includes an interactive map, online publications, and extensive reports. The Berenike Project: Website for the excavations at Berenike by the University of Delaware and Leiden University conducted between 1994 and 2001. Buto/Tell el-Fara’in: From the German Archaeological Institute. In addition to details on the project, this website gives a good overview of the site. Jerba Online: University of Pennsylvania. Dakhleh Oasis Project: Monash University. A long-term regional study of the interaction between environmental changes and human activity in the Dakhleh Oasis area. The website includes their annual reports. North Kharga Oasis Survey: The American University in Cairo. The website includes overviews of each site in the study and summaries of each field season. Sais: Egypt Exploration Society and University of Durham, in collaboration with the Supreme Council of Antiquities. This project began in 1997, and reports are available for every field season. The American School of Classical Studies’ pages on their Excavations in the Athenian Agora and Excavations in Ancient Corinth feature a wealth of data, including published reports, objects, photographs, and drawings. Integration with the ASCSA’s other online resources rounds out the experience. The Azoria Project: The University of North Carolina and Iowa State University’s excavations of an Early Iron Age and Archaic site on Crete. Kalavasos and Maroni Built Environments Project: Cornell University. Diros Project: The Field Museum, Chicago, and Millsaps College. Excavations at Isthmia: Ohio State University. Includes preliminary reports going back to 1992, some digital notebooks, and summaries of various areas of the site. Iklaina Archaeological Project: Interdisciplinary project to explore the relationship between core and periphery in the Greek world and the operation of Mycenaean states. Kommos Excavations: University of Toronto. Fieldwork is not currently active, but this site includes extensive maps, images, an overview of the pottery, and more. Kythera Island Project: An interdisciplinary project bringing together teams from more than 20 countries and a wide range of disciplines including archaeometallurgy, geoarchaeology, botany, and many others. Mitrou Archaeological Project: The University of Tennessee and the Greek Archaeological Service. Information about the site, the project, and the fieldschool. Mochlos Excavation Project: University of North Carolina at Greensboro. Accessible site for the layperson. Includes detailed information on the site, fieldwork, and list of publications. Mt. Lykaion Excavation and Survey Project: Collaboration of ΛΘ’ Ephorate of Prehistoric and Classical Antiquities, Tripolis, Arcadia; University of Pennsylvania Museum of Archaeology and Anthropology; and University of Arizona (under the auspices of the American School of Classical Studies at Athens). Mycenae Excavations: Dickinson College. This website is packed with information and is a great starting point in learning about fieldwork at Mycenae. The Nemea Valley Archaeological Project: Bryn Mawr College and the American School of Classical Studies at Athens. Includes extensive maps and images of the site. The Pylos Regional Archaeological Project: This site includes preliminary reports and links to publications, a gazetter, and databases for pottery, small finds, and images. There is also a 3D tour of the Palace of Nestor and general information on Hellenistic Messenia. American Excavations Samothrace: Emory University and Institute of Fine Arts at New York University. Saronic Harbors Archaeological Research Project: Multidisciplinary project to explore human interactions in the Saronic Gulf. Sarpedon - The Sissi Archaeological Project: Collaboration of the French and Dutch speaking universities of Louvain/Leuven, under the auspices of the Belgian School of Athens. This site includes preliminary results, virtual tours, and lots of images. Sikyon Project: A multidisciplinary project to study human presence and activity at Sikyon. The Sphakia Survey: An interdisciplinary archaeological project whose main objective is to reconstruct the sequence of human activity in a remote and rugged part of Crete, from the time that people arrived in the area, by ca. 3000 B.C.E., until the end of Ottoman rule in 1900 C.E. The Sphakia Survey: An interdisciplinary archaeological project whose main objective is to reconstruct the sequence of human activity in a remote and rugged part of Crete, from the time that people arrived in the area, by ca. 3000 B.C.E., until the end of Ottoman rule in 1900 C.E. Excavations of the Baths at Roman Carsulae: Directed by Jane K. Whitehead, Valdosta State University. The site offers details on the excavations and upcoming field season, high-quality photographs, and links to previous reports. The project is also on Facebook. The Gabii Project: Under the direction of Nicola Terrenato, University of Michigan. This site is kept up-to-date with recent publications, information on the field program, and reports on fieldwork. The project also has a Facebook page. Kent-Berlin Ostia Excavations: A site maintained by Luke Lavan, University of Kent, and Axel Gering, Humboldt University, includes an overview of the site, aims of the project, and details of finds and inscriptions. Metaponto Project: Institute of Classical Archaeology, the University of Texas at Austin. Concise overview of the site and excavations. Mugello Valley Archaeological Project: Southern Methodist University and Franklin and Marshall College. Includes information on the project and field school. Selinunte: Institute of Fine Arts at New York University. Madaba Plains Project (Jordan): Andrews University and La Sierra University. The project began in 1968 at Hisban and is currently studying the sites Hisban, Umayri, and Jalul in Jordan. Each site has its own dedicated webpage. Petra Archaeological Project: Brown University. The Petra Great Temple Excavation (Jordan): Brown University. This site provides a wealth of information on Petra and its excavations. The Tell es-Safi/Gath Archaeological Project (Israel): This website has an overview of the project, a blog, gallery, and information for students. The Excavations at Tell Atchana (Alalakh): A comprehensive site, including reports from excavations, galleries, details of experimental archaeology projects, and more. Aphrodisias: New York University. Brief overview of the site and some of its areas, excavations, and surveys. Çatalhöyük Research Project: Since 1993, a team lead by Ian Hodder has been conducting excavations at this Neolithic site. This website is updated often and hosts a variety of content, from reports to videos to a database. Central Lydia Archaeological Survey: Boston University. Details excavations from 2005 to the present. The Kerkenes Project: Middle East Technical University and British Institute of Archaeology at Ankara. Of interest are reports from 1993 to the present, galleries of photographs and drawings, and information on remote sensing. Tayinat Archaeological Project: The University of Toronto. Details current and past excavations and reports. Tektas Burnu: Institute of Nautical Archaeology, Texas A&M University. This site deals with the classical Greek shipwreck excavated between 1999 and 2001 and discusses the excavations and conservation efforts. The Chicago Manual of Style: The AJA’s preferred style source and an authority on grammar. If your university has access, you can search and browse the full text online. The Publishing Process for Beginners: Start to Finish: PDF handout from the AJA’s presentation at the workshop “The Publishing Process for Beginners: Start to Finish” at the 2011 AIA Annual Meeting in San Antonio. Publishing in Classical Archaeology: Tips for the Timid: PDF of a talk given by Tracey Cullen (former Editor, Hesperia) at the workshop “The Publishing Process for Beginners: Start to Finish” at the 2011 AIA Annual Meeting in San Antonio. New Athena Unicode Font: Free Greek font from GreekKeys (American Philological Association).